To download images, Right click image or link and choose Save Target As (Internet Explorer) or Save Link Target As (Mozilla/Netscape). Inventory Accuracy is topic of new book. 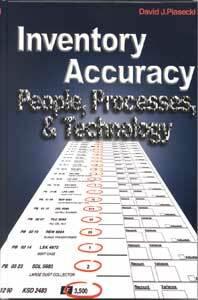 Inventory Accuracy: People, Processes, & Technology is the newly released book by David J. Piasecki of Inventory Operations Consulting LLC. The book provides a comprehensive treatment of inventory accuracy in distribution, fulfillment, and manufacturing environments. Topics covered include cycle counting, physical inventories, process evaluation, training, accountability, and various technologies including bar codes, voice technology, RFID, and light-directed systems. The author has gained recognition in recent years through his no-nonsense articles on subjects related to inventory management, manufacturing, and warehouse operations. In addition to being published in numerous industry magazines, he also publishes materials on his popular website www.inventoryops.com. Inventory accuracy starts with an understanding of the conditions under which errors occur and ends with error-resistant processes, intelligent use of technology, a well-trained and highly motivated workforce, and an ongoing process of continuous improvement. In between, there’s cycle counting, root cause analysis, process evaluation, user interface design, procedures, employee training, accountability, control methods, process checks, audits, exception reporting, transaction techniques, measurement, counting methods, bar codes, RF systems, speech-based technology, light systems, and software. Inventory Accuracy: People, Processes, & Technology covers all of these topics and more in a comprehensive treatment of the subject of inventory accuracy in distribution, fulfillment, and manufacturing environments. In addition to documenting the standard tools and techniques used to achieve accuracy, the author provides insights as to why many of the standard solutions don’t provide the best results and offers alternative methods. The focus on practical solutions that take into account the sometimes-conflicting priorities that affect accuracy, results in an approach that not only looks good on paper, but more importantly, works in the real world.